A few weeks ago, I got talking to an eighteen year old Pakistani design student called Fatima, one of the organisers of #SouthAsianArtists (blog post to follow). The hashtag, inspired by #DrawingWhileBlack, aimed to shine a light on South Asian designers and their work. 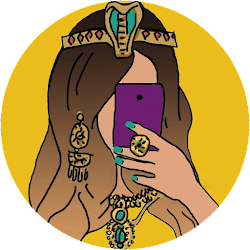 It quickly went viral and has brought the work of so many visual artists and graphic designers, particularly South Asian women, into the spotlight. While speaking with Fatima, I couldn't help but wonder whether South Asian writers and poets could benefit from something similar. There are so many of us out there, dabbling and experimenting, who perhaps haven't honed their voice fully yet; and some who have. Regardless of skill level, and how established you may or may not be, I wanted to create something that just celebrated that we're here, balls out, chappal on, just doing it. 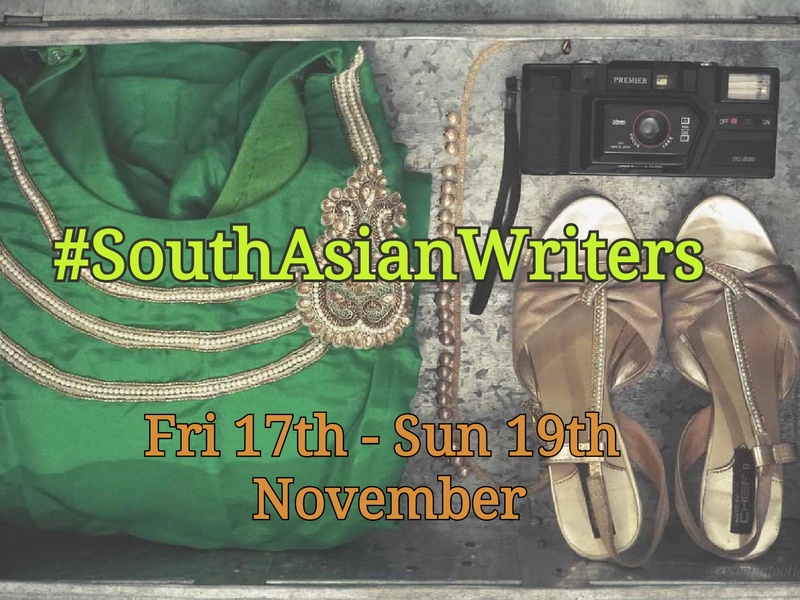 #SouthAsianWriters will be running on Friday 17th - Sunday 19th November. 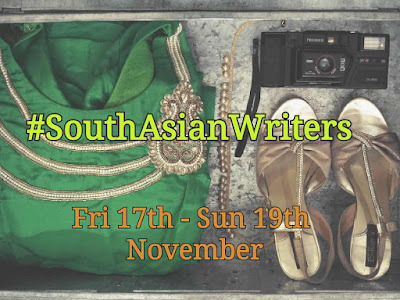 It aims to encourage writers and poets of South Asian descent to introduce themselves on Twitter and signpost to their work using the hashtag #SouthAsianWriters. My main objective with this campaign is, not only to champion both emerging and established writers, but to create a space where minority voices feel safe to engage and, hopefully, have visibility enough to be featured or published in the future. Social media has created an extraordinary sense of kinship between minority communities, particularly when it comes to articulating and validating our own experiences of marginalisation and feeling othered. Although there have been more efforts geared towards BAME writers in the publishing industry in recent years, hashtags like #SouthAsianWriters act as toggles, immediately and inadvertently creating social spaces. It's within these spaces that we'll find emerging talent, raw potential, community and, most importantly, encouragement and support. Ok, there is a very realistic chance that this will go absolutely nowhere; but imagine if we created a community that extended beyond this weekend. 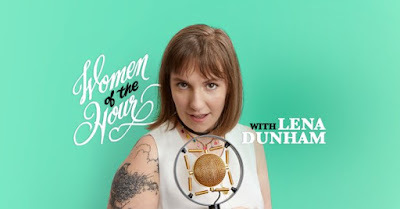 One that is always open to new talent, perspectives, and emerging voices. The South Asian, desi, first / second / third generation, minority and mixed experience is so intersectional; and there is absolutely room enough for every story to be told. Speaking of which, I'm Nadia. I'm a short, loud, hyperbolic British Pakistani woman that just won't shut up. Who are you? 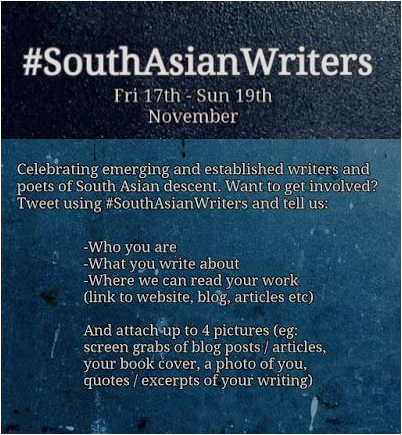 If you'd like to take part, tweet using the #SouthAsianWriters hashtag, including the info above. If you want to share more links to your social feeds etc, tag me (@cocoapatootie) on Twitter and I'll check them out. Please show some love to anyone taking part and like, retweet and share their work if you can. If you aren't South Asian, you can still get involved too. This is all about showcasing and celebrating South Asian talent so, if there's an author, poet, playwright, writer, blogger etc. that you love, or think we need to know about, tell us about them! Ok, Grandma's tired now, children. I need a cup of tea and Stranger Things / bed. I'm going to be tweeting / posting about this over the weekend so, do me a solid, and be kind, you glorious pack of wolves. The House of Snark, The Bridge on Jamiroquai.... you know who you are.